There are tons of great happy hours around town…many of which are largely unknown. For the first of what will become an ongoing series, I will highlight Via Vite’s great happy hour. First of all, Via Vite’s happy hour is EVERY day and lasts from 3-6 (I was told 7pm by our waitress the other week). Unfortunately they don’t offer any draft selections, but they do serve Christian Moerlein’s OTR Ale. 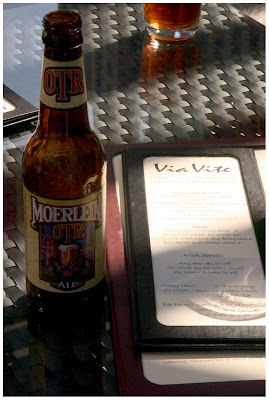 After you take the $1.50 off you’ll be enjoying some great OTR Ale for $2 on Via Vite’s rooftop terrace. The food specials also make it a great spot to start off your evening downtown. The wood fired pizzas are great for sharing with a friend and are at a great happy price – $7. If you’re in the mood for a great happy hour today then be sure to check out Via Vite. The location is to die for and the food and drink live up to the high expectations. View pictures from Via Vite’s rooftop terrace HERE!